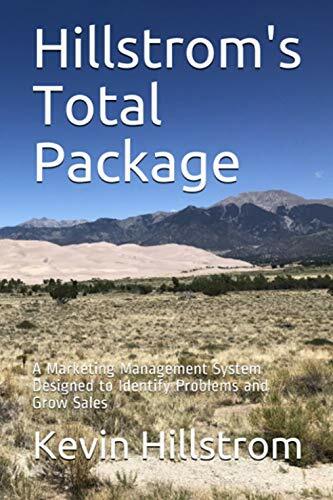 I received your feedback about Hillstrom's Zip Code Forensics, arriving at a final pricing strategy for the cutting-edge direct marketing zip code model segmentation strategy. Beta Clients: Free, plus your own customized zip marketing model. Not too bad, eh? 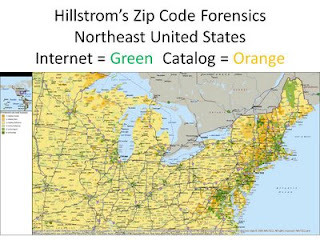 Hillstrom's Zip Code Forensics: Free to those who contribute anonymous sales by zip code. Did you read that correctly? Yes you did! Free! FREE! 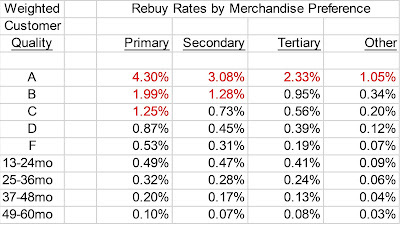 If you do not wish to contribute anonymous sales by zip code, the cost is $5,000 per year, a price that is dramatically cheaper than what you'll pay for PRIZM clusters/segments available from Claritas! Did I mention that if you elect to contribute anonymous sales data by channel by zip code, you receive the product for free? Show me anybody else in the industry who is trying to help you through a challenging economic environment by offering something of significant value ... for free? Hillstrom's Zip Code Forensics offer six segments that span all zip codes in the United States. Catalog Crazies: Zip Codes that have customers who crave catalog marketing and spend twice as much as the average zip code. Online Bliss: These folks are all about e-commerce --- spending nearly twice as much as the average zip code. Catalog Fans: Average performing zip codes with customers who like catalog marketing. Online Spend: Average performing zip codes comprised of consumers who prefer e-commerce. Catalog Preference: Urban and rural zip codes with customers who only spend 1/3 of the national average, skewing toward catalog marketing. Online Preference: Urban and rural zip codes with customers who only spend 1/3 of the national average, skewing toward e-commerce. 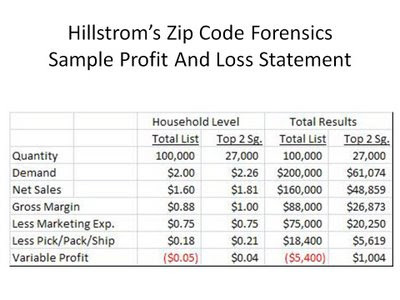 Based on results obtained from folks participating in the beta test of the product, e-mail marketers, direct marketers, and catalog marketers may experience profit increases when applying Hillstrom's Zip Code Forensics to lapsed customers (those who haven't purchased in more than a year) as well as prospect lists. The chart at the end of this post illustrates the average improvement in performance across lapsed customers, if customers in the top two segments (catalog crazies and online bliss) are targeted. If you are interested in participating, please contact me for instructions on obtaining the free version, or to purchase the $5,000 version without providing your anonymous sales totals by zip code by channel.